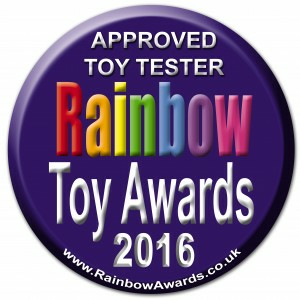 We were thrilled to be selected as testers for the Rainbow Toy Awards 2016 and were very excited when we received the new BANAGRAMS party edition to review. We already have the original BANAGRAMS game which is great fun so I was interested to see what this new version was like. BANAGRAMS Party has been launched to celebrate BANAGRAMS 10th birthday and has a RRP of £14.99. The game can be played by 2 - 8 players although if you have more you could play in teams. The suggested age is 10+ but Luke, who is 10, has been playing BANAGRAMS for a couple of years now and does really well. I always find word games can be adapted to your children and they are great for helping them learn to spell. The game is in a fabric banana shaped bag which makes it very portable, we always take BANAGRAMS on holiday with us as it can easily be put in your bag or suitcase and doesn't take up much space. The party edition has an additional 14 tiles, some make the game more challenging and others are guaranteed to make everyone laugh! The game is played in exactly the same way as the traditional BANAGRAMS with the ultimate aim to be the first to use all your letters. 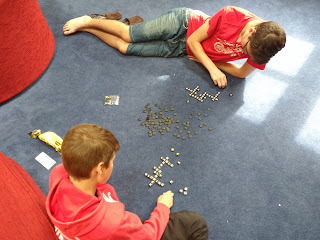 The game starts with each player selecting a number of letter tiles from the bunch, the total taken depends on the number of players and is listed in the easy to follow instructions. Once everyone has their tiles the party tiles are added to the bunch and mixed in. You play with as many of the party tiles as you like but we tend to find it is much more fun to have them all in play. The game starts with one player shouting "SPLIT" and everyone turns over their tiles and tries to make words in a crossword style, very similar to Scrabble but without a board. Everyone plays at the same time so there is no waiting for your turn. Whenever a player has used up all their tiles they shout "PEEL" and everyone collects another tile. 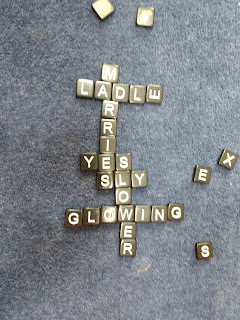 You can re arrange your tiles as much as you like to use all the letters. If you have a handful of tricky letters like "Q" "X" or "Z" you can choose to swap them by saying "DUMP" and putting them back in the bunch - you have to take three tiles for each one you dump. I find this can be quite helpful at the start of the game. When you draw a party tile it must be used immediately, some tiles have a one off action like stealing a tile from another player or swapping places with a player and taking over their grid. Others continue until you have used all your tiles, these tiles can be quite distracting for both the person doing the action and his opponents. Luke especially liked it when William picked the Flamingo tile which meant he had to stand on one leg for the rest of his hand! When the bunch has fewer tiles than there are players when you put the last letter in your grid you say "BANANAS" instead of "PEEL." Your grid is checked by the other players and if any grids have misspelled words or unacceptable words then the others shout out "ROTTEN BANANA" and you are out of the game. 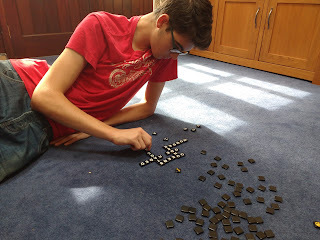 The tiles are returned to the bunch and play continues until "BANANAS" is called again. 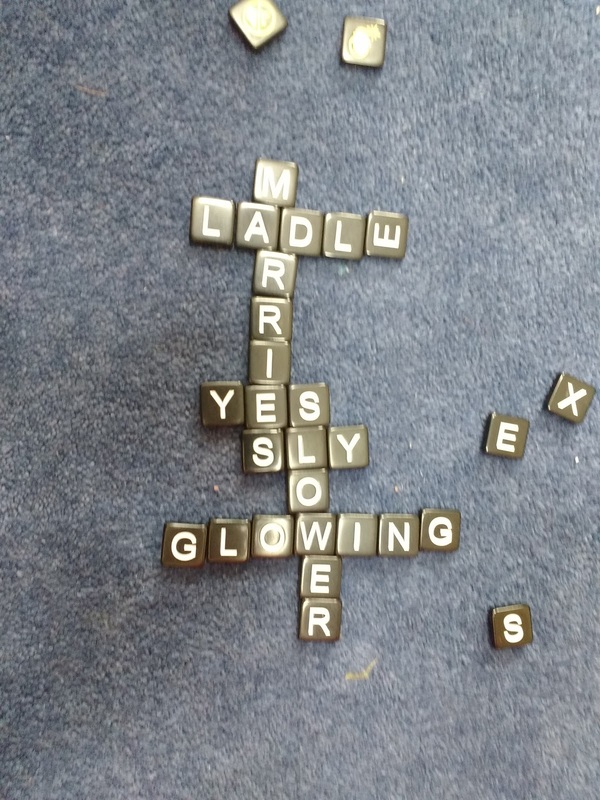 The winner is the person who uses all their tiles first and has a grid full of acceptable words. A dictionary can be useful at this point in the game!! 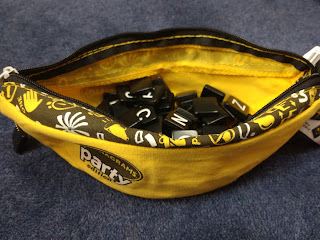 We really enjoyed playing BANAGRAMS party and it has been played lots of times during the summer holidays. 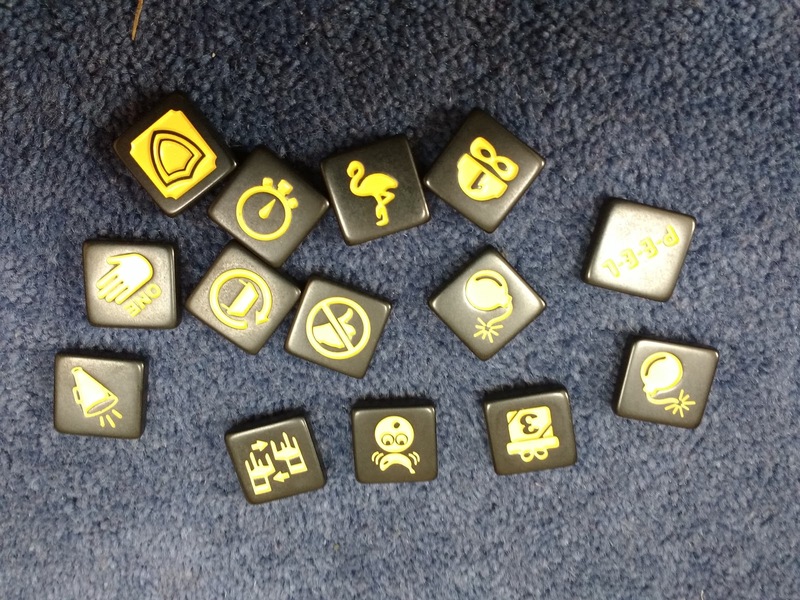 The addition of the party power tiles means the game is less serious and more appealing to children and great when you have lots of people to entertain. We would certainly recommend this game and it is a fantastic addition to the BANAGRAMS family.